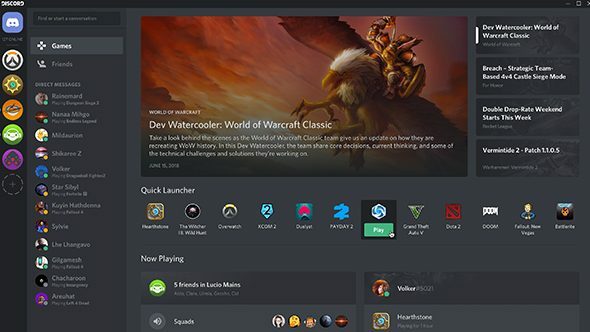 Next time you log into Discord, you’re going to see something new: the games tab. It offers a whole array of useful new features, but the thing that we’re going to take away is that these features, all together, have started to make the voice chat service look a lot like Steam. The new tab delivers news on the games you play, including patch notes and general updates. It also offers a launcher bar for quick access to all your recently played games. It shows what your friends are playing, and gives you the option to quickly join their games from this screen – or their Spotify listening groups, or Twitch streams, or whatever other strange partnerships come to Discord in the future. Talk your frinds into joining you for a journey into one of the best MMORPGs on PC. All these features make sense for the connected service Discord provides, and all manner of social gaming apps are starting to cross over into each others’ territory in an effort to be the singular ur-app used to satisfy all your gaming needs. Steam’s new chat beta looks a whole lot like Discord, and while these new social features aren’t quite as similar, the inspiration seems clear. You can log into Discord yourself to see what’s new, or check out the video below for a more immediate look – along with a terrible but too-silly-to-hate metal jingle. With these changes, it seems likely we’ll continue to see Discord extend its feature reach even further. How far? Well, Steam’s now a chat service and Twitch sells games, so the sky’s the limit at this point.